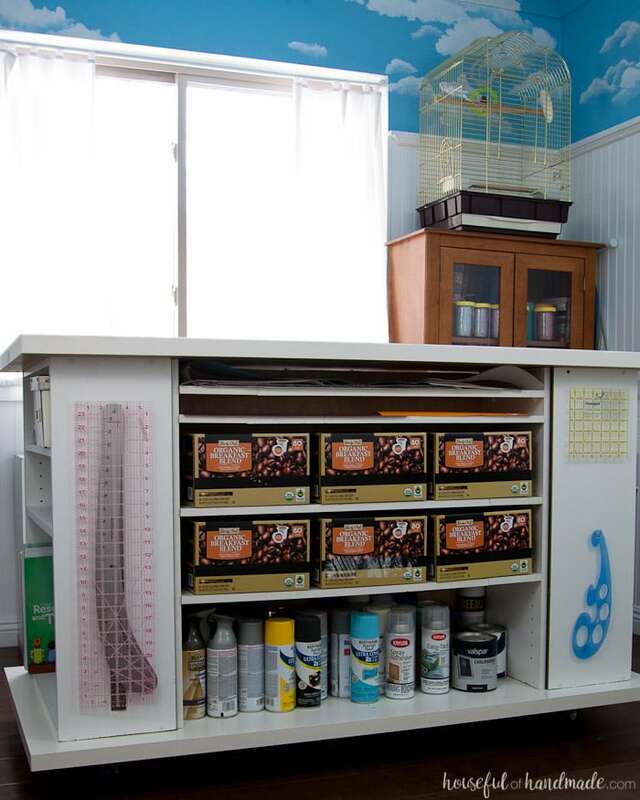 OMG, there is only 1 week left to wrap up this Office & Craft Room Makeover! And my money is almost gone. Well, $100 can go pretty quickly, but I am proud of how carefully I’ve spent it. The biggest purchase, a $32 piece of plywood, was used for 3 projects. I think I got my money worth. I also really utilized the scraps of wood cluttering up my garage. I have always been afraid to toss anything bigger than a couple inches and now I am glad I kept it. Last week I was able to build this DIY paint storage completely out of scraps of ugly, twisted wood that I was hoarding for the right occasion. When I built the rolling workstation out of some old bookcases, I filled the bottom shelf full of my spray paint cans. This seemed like a great place to store them. As I moved the rest of the cans that were stored haphazardly in my garage, I realized this wasn’t the best solution. Apparently I had a lot more spray paint then I thought. I also seemed to have a lot of duplicates because my storage solution before was less than stellar. While I was in the garage building the farmhouse console table for the space, I found a scrap of 1×10 that was about 40″ long. But it was warped and twisted, not something that I would be able to use for a larger project. Usually I would cringe at cutting up a larger board like this, but since it was not getting any use as it was, I decided to turn it into the perfect DIY Paint storage solution for my new office & craft room. I was pretty excited about completing this project out of scraps of wood and left over white paint. 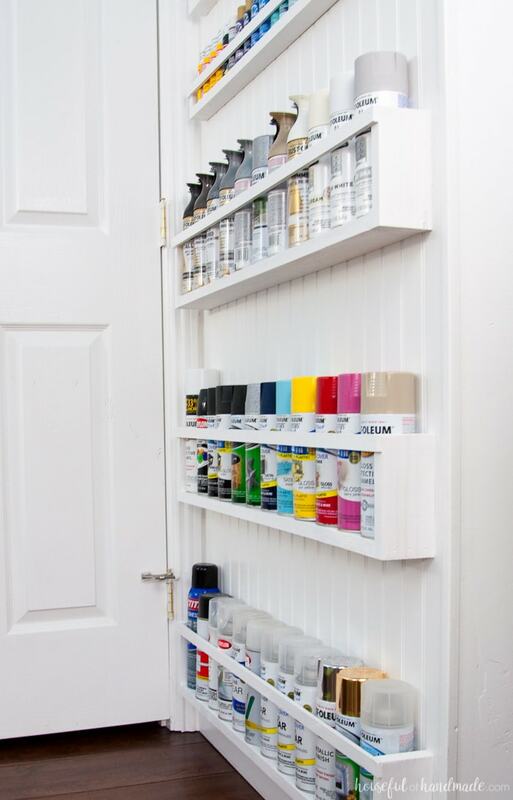 However, when it came time to hang my awesome DIY paint storage shelves, I realized I didn’t have a good solution without spending a few dollars. So I ran to the Home Depot and found some 1″ L-brakets. Luckily the pack of 20 was only $7.50. I figured it was worth it for this awesome storage solution. So all in all I completed this project for only $7.50! If you have been on the fence about whether you wanted to add a table saw to your arsenal of tools, maybe this post will convince you. Honestly, I don’t know that I would have been able to easily create all the budget friendly DIYs without it. It allows you to do so many things with scraps. This last week I did take a bit of a break from projects, the sun was shining and we enjoyed the beginnings of spring! It’s really good we have 5 weeks this month. But I did manage to spend a little time working and completed the cube bookcase makeover. I still can’t believe that old piece looks this good now! I also got started on the legs for the sewing table, an ironing board/iron storage solution and prettying up all those coffee boxes in the rolling worktable. Luckily for me, my husband and I have a coffee addiction so the boxes just keep coming. Now I just need to spend a day organizing everything into the boxes. I can’t wait to share these projects! And how is the budget coming along? That leaves me with only $12.50 to finish my room! Yikes. Here is the list of what I wanted still to accomplish. I am pretty sure I am going to have to scrap the desk sconces (due to time and budget). Also, I settled for sticking my photography equipment on the high shelf in the closet because I just didn’t like it being out in view. And whether I have enough fabric that will work in my stash to cover the desk chair is still up for debate. This weekend I will be finishing the storage boxes, sewing table legs, and then painting the sewing table and curio cabinet. Then next week I will say good-bye to the clouds and try to add a bit of decor with my measly little budget. I can’t wait to share the final room with you next week (and then take a much needed break)! And don’t forget to see how these other $100 room makeovers are coming along. There is so much creativity and budget genius going on I can’t stand it. What size board did you rip these down from? I’d like to be sure I get the right width so that my front edge is the right depth. Thank you! Nevermind… I just read again and saw that you started with a scrap 1×10. So, the better question is how wide is the ripped front edge? I do have a table saw, so I can do a thin cut. The pieces on the front are 1/4″ thick. Just enough to hold the lightweight paint cans/jars but not big enough to be intrusive. Have fun building! I love having my paint stored so pretty and organized. You can rip them down from whatever size boards you have in your scrap pile! That is the best part of this project. Oh my goodness! 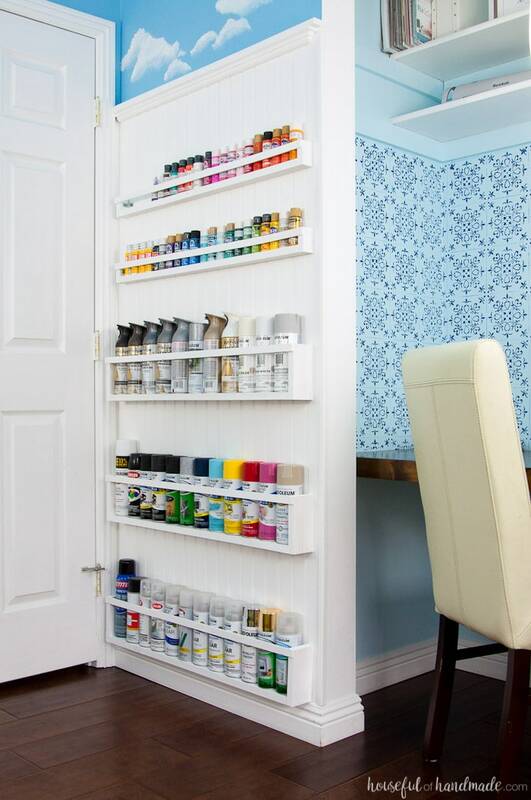 I *need* this paint storage so badly for my disaster of a craft room. 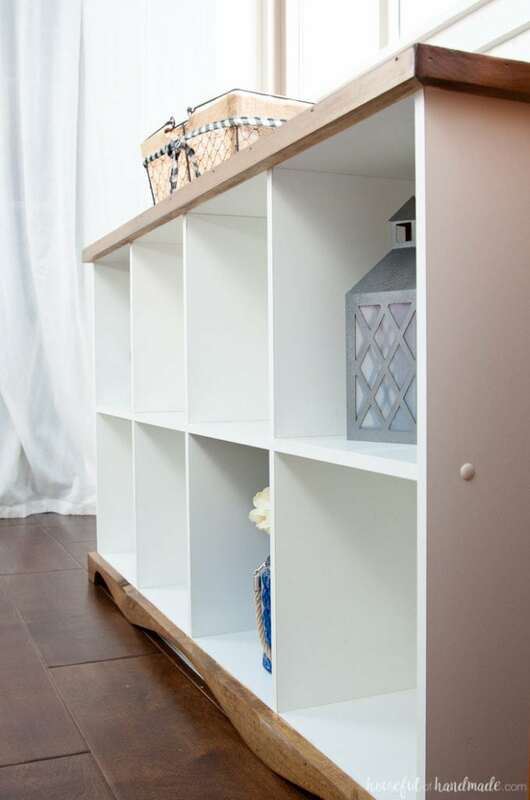 Fabulous job with your craft room ~ I can’t wait to see the rest of it! Wow! What a great idea! I’m envious of your massive collection! Thanks Tracy! I love that I can see it all now. dang that’s a lot of paint! it looks like a work of art now! Yeah, I might have a paint problem. Thanks Morgan! 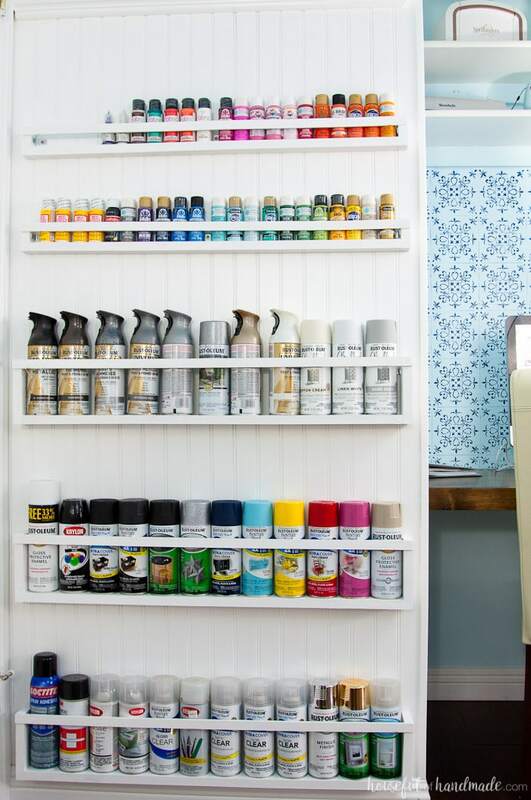 That is awesome, I have total paint storage envy right now! Thanks Bharati! I’m so glad I acted on a whim and made these shelves. This would work perfectly for a garage too. Thanks so much for your nice words! I can’t wait to see what you do with those coffee boxes! Amazing how much you get done in a week and with so little money! Great work! 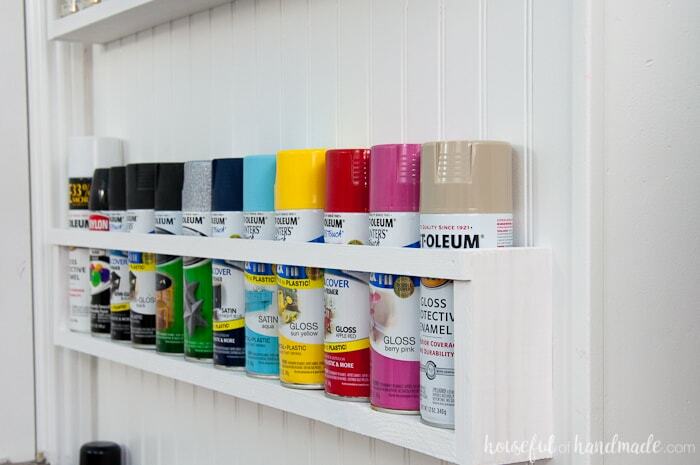 Your collection of spray paint is the stuff DIY dreams are made of! And I love how you have it displayed – it’s genius! I’m looking forward to the big reveal next week!